Home / Ireland / #Dublin: Call for solidarity with our Russian comrades! #Dublin: Call for solidarity with our Russian comrades! Dublin: Demo outside the Russian embassy on the 20th of June at 7pm. 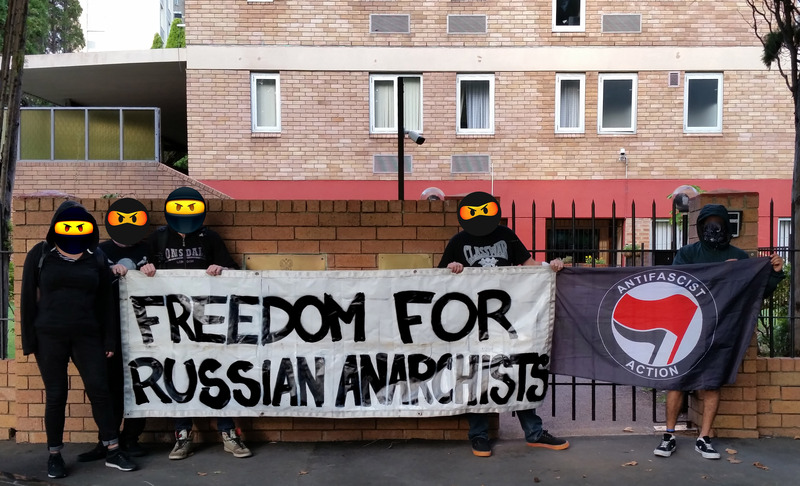 Starting in the autumn of last year FSB have been arresting antifascists and anarchists organising boycotts of the presidential elections and upcoming World Cup to be held in Russia. They invented an anarchist terrorist group call ‘the Network’ and used the all the creativity of the state to make this fiction appear true. The FSB have planted evidence, kidnapped people and systematically used beatings and torture with electric shocks to produce confessions. Our comrades are being held in unbearable conditions in over-crowded detention centres to break them mentally as well as physically. This cannot continue in silence. The world’s attention will be on Russia with the FIFA World Cup beginning 14 June. Let’s raise our banners and not let our comrades be forgotten.